Look at your calendars guys, spring is coming, and it’s the perfect time to start our little chat about the upcoming 64th Festival de Cannes that will, this time, be held from 11th to 22nd May! 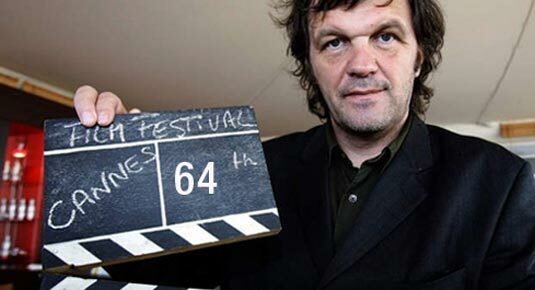 As usual, we’re all interested to see who will be in charge, or if you prefer – who will preside the Un Certain Regard jury, we’re here to inform you that Emir Kusturica, the Serbian film-maker is on board for that one! Every year, Un Certain Regard, at the very heart of Official Selection, alongside the Competition, presents around twenty films from countries the world over that are characterised by the originality of their ideas as well as their aesthetic. We’re not surprised with this decision. Emir Kusturica received the Palme d’Or in 1985 for his second film When Father Was Away on Business and then, ten years later, his second Palme d’Or for Underground made him a member of that elite group of directors who have twice been honoured on the Croisette. Accompanied by a jury made up of artists, journalists and festival directors, Emir Kusturica will award the Prix Un Certain Regard, together with the other festival awards, over the closing weekend. Let me just remind you that the 2010 Prix Un Certain Regard was awarded to Hong Sang Soo for Ha Ha Ha, which was recently released in France. Who will be lucky this year? We’ll have to wait and see, and you guys, make sure to stay tuned! Until now, we know that Robert De Niro will be the president of the 2011 Cannes Film Festival Jury while Michel Gondry will head up the short film and Cinéfondation jury of the 64th Festival de Cannes.